Begin by preparing wood. Cut maple crosspiece and one of the three remaining 1x12 pieces to the required size. Knock down edges, sand, and coat w/ at least 2 coats-preferably 3-of satin finish polyurethane. The other two pieces should be slightly larger than the finished size. Glue them together with wood glue in order to form a single piece 2" thick. Clamp and let dry overnight. Trim to final size. Ideally this would be done on a table saw, but a circular saw should work. It is probably too thick for a jigsaw, though. Sand and polyurethane. This forms the press base. Take platen and place it on top of pipe ends, marking the pipe location onto the platen surface. You'll need to draw a u-shaped cutout in both platen ends; Start on the edge slightly to the left of the mark showing the pipe location, come down, loop around the pipe, and end on the edge, slightly to the right of the mark showing the pipe location. This will serve to guide the platen as it rides along the pipe, minimizing any lateral movement. Mark center of platen, and locate screw retaining flange on it. Mark pilot holes. Locate stiffeners evenly on either side of retaining flange, drill pilot holes and secure with # 14 1 1/4" screws. 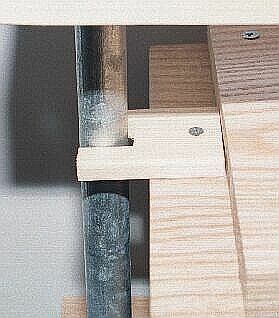 Mark center of maple screw support and drill a large enough hole to just accommodate the screw. This is best done on a drill press, because the hole needs to be precisely positioned and must be perfectly vertical. Place platen in place on pipes, and thread top flanges on. Position maple screw support on flanges and mark screw positions. 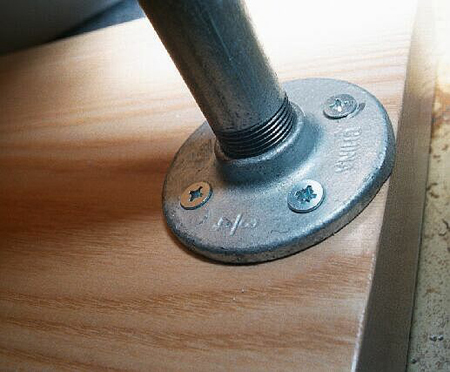 Place bench screw in hole and mark mounting screw positions. 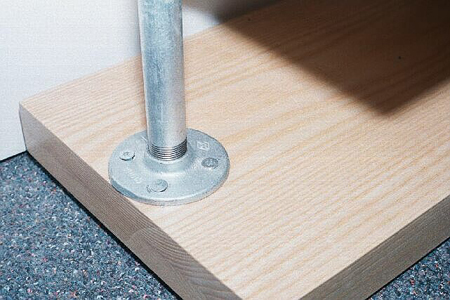 Raise platen up and support it, so that you can ensure that the bench screw, maple support, platen and bench screw retaining flange line up properly. Once you are sure everything is in position mark screw positions, or double check those marks you might already have made. Drill all pilot holes in maple support and platen, attaching screw retaining flange to the platen. 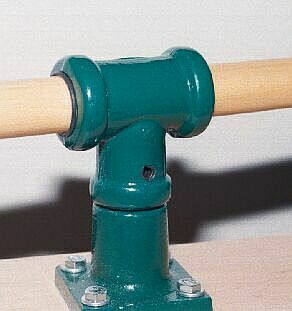 Center dowel in screw handle, and secure in place with "O" rings. Although screws work OK, I found that the lag screws are much easier to work with. It's far too easy to strip the screw head in the hard wood, (Fig 3) especially if the pilot holes are not quite the correct size. The torque achieved in using a ratchet and lag screw makes it a lot easier, especially in attaching the maple support to the flanges, as its tough to get sufficient torque on a screwdriver. Or even to get a screwdriver in there. Drill the correct size pilot holes. 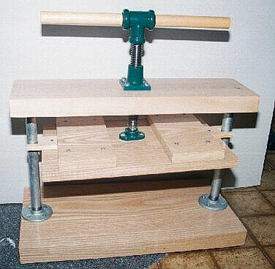 . .
As constructed, there are approximately 5 1/2 inches of working area between the platen and base with the platen fully lowered, and approximately 10 1/2 when raised. This can be increased by using longer pipe. A 4x4 sheet of 3/4" birch plywood can be cut in to 12 pieces, each 12 x16, which fit perfectly on the base for use as pressing boards. Sand them as smooth as possible but DON'T polyurethane them. If you do, the force of the press will make them stick together as if they had been glued. Don't ask me how I know. . . It's VERY important that the bench screw and retaining flange are positioned properly and that everything line up correctly. Otherwise the platen may bind against the pipes or the screw may not seat securely in the retaining flange. Take your time and make sure everything goes where you want it. All together, I spent about $100 for the project, not including the plywood used for the pressboards. It's certainly not a Vaggelli, but it will do the job. For about $ $5500 less.